RSS is a convenient way to stay abreast of news stories or articles added to a particular web site. Rather then needing to visit your favorite web site over and over, you can use RSS to be notified when a new story or article has been added as well as read some or all of that article. I like to read my RSS feeds in my email application, Mail. 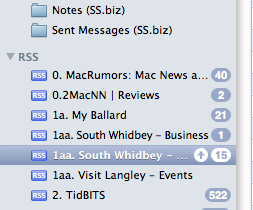 Update: Apple Mail no longer supports RSS feeds in OS X 10.7 or 10.8. This tip only works on OS X 10.6 or earlier. Below are instructions on how to add an RSS feed to Apple’s Mail application. Open a web browser, like Safari, and go to a web site that offers an RSS feed. I’ll use Tidbits.com as my example. Go to http://www.tidbits.com . In the right-hand end of the address field you’ll see an RSS icon as depicted in this picture. Click on the RSS icon. 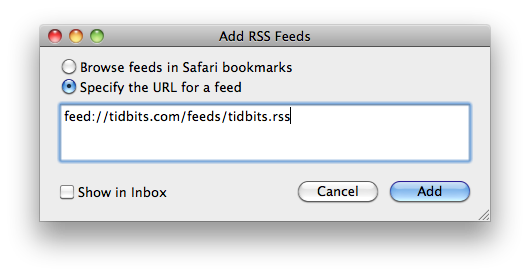 Copy the feed address, feed://tidbits.com/feeds/tidbits.rss by highlighting it and selecting Copy from the Edit menu. Open Mail and select “Add RSS Feeds” from the File menu. In the Add RSS Feeds window select “Specify the URL for a feed” and select Paste from the Edit menu to paste the feed address (aka the URL) into the field. Use the picture below as a guide. In a few seconds, you’ll see the Tidbits feed listed on the left-hand window of the Mail window under the “RSS section” as depicted below. The number to the right of the RSS feed’s name is an indication of the number of unread articles. If you have added a number of RSS feeds, you may want to rename them so they sort in a particular order as I’ve done by adding number prefixes. Read more about add, Apple, Mail, RSS feed.